If most of your teeth are broken-down, decayed or missing, and it’s difficult or painful to chew, it’s time to do something about it and get a full-mouth rehabilitation. Dr. Noveck and Dr. Nosti have been awarded fellowships for their work in full-mouth restoration. Dr. Milt Noveck and Dr. John Nosti are highly trained and experienced in dental restoration. Both are considered leaders in the field of full-mouth rehabilitation. They know how to guide a case to the successful restoration of a mouth’s full function, health and beauty. Between them they have completed many hundreds of full-mouth rehabilitations. Their aim is to restore the patient’s mouth to its natural state before it was broken down. In some cases we can even improve on the original! Learn more about Dr. Noveck and Dr. Nosti. Sometimes patients come to us with a combination of dental issues, such as missing teeth, decayed teeth, a bad bite, gum disease and broken-down dental work. They have been too afraid of the dentist to get their teeth addressed earlier, or they have had poor dentistry and are not sure how to get it fixed. We have helped hundreds of patients with complex issues to regain full oral health and function. Our doctors have a gentle touch and will keep you comfortable throughout your treatment. When possible, we use conservative, minimally invasive procedures and technology that give little to no post-treatment discomfort. Our doctors and staff are friendly and caring and will listen to your concerns at all times, answering any questions you have. They will clearly explain all procedures ahead of time. Wherever we can, we will save your teeth. Sometimes the more healthy option is to extract badly decayed teeth. Our doctors will advise you on what would be best for your situation. An important part of a full-mouth rehabilitation is making sure the bite is aligned. Above, Dr. Nosti using our T-Scan® to record the patient’s bite. About 90% of the patients who come to us for a full-mouth rehabilitation have destroyed their TMJ, the jaw joint. If this is not also addressed, a patient will continue to experience pain or chewing problems even after their teeth have been restored. We use advanced diagnostic and treatment technology to return full function to the TMJ and repair the bite (how the teeth come together). 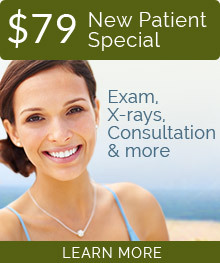 A thorough exam and consultation allows us to create the right treatment plan for your needs. On more complex treatment the doctors will plan cases together. Restoring a mouth to proper function, health and esthetics in a way that also lasts requires thorough planning and careful treatment. Our doctors collaborate on more complex cases, even bringing in their partner specialists if needed. They do various diagnostic tests of your jaw and mouth, take impressions and measurements, and a dental CT scan (3D X-rays), as needed. They plan each step of treatment ahead of time using study models and 3D software. Dr. Noveck uses a facebow to aid in correcting a person’s bite so it is fully comfortable. Dental Implants to replace missing teeth using crowns, dental bridges or dentures. High-quality, durable and aesthetic Porcelain Crowns to restore the integrity of the tooth, to strengthen it or to improve the bite (how the teeth come together). Porcelain Onlays and Inlays—An onlay covers the cusps of the tooth and an inlay is inside the cusps. They are a very conservative alternative restoration for a moderately broken-down or decayed tooth. Dr. Nosti shows patient, Helen, how her new teeth will look and function. Here you can see the models of the teeth mounted in an articulator that simulates jaw function. to correct crooked teeth or change the appearance of stained, yellowed, pitted or chipped teeth. Root Canal Therapy to save a dead tooth. Gum Disease Treatment, vital for saving teeth. TMJ or Bite Treatment to ensure a comfortable, properly functioning mouth. The teeth of this patient of Dr. Noveck were in very bad condition due to years of teeth grinding and failing restorations. His full-mouth rehabilitation included sinus surgery, dental implants, soft tissue and bone grafting, periodontal gum surgery, root canal therapy, porcelain veneers and porcelain crowns. “After years of wear and neglect, Dr. Noveck completely restored my dental health with a systematic and comprehensive approach. He coordinated the restoration with dental surgeons and spent countless hours in planning a complete makeover. There was never a time when I didn’t have complete confidence in his ability, care and treatment. He even made himself available for those unforeseen emergencies when his office was closed. A more caring professional would be difficult to find. His skill and dedication to his profession is worthy of the highest accolades. Nothing less than perfection is acceptable to Dr. Noveck. I now can smile again and not be embarrassed about my dental appearance.” – F. O. “I went to the periodontist who had done two implants for me a decade earlier. His reaction to the dental work I had experienced led me to ask him if there was a dentist he would like me to see. He told me about a dentist he worked very closely with on difficult, complicated and/or extensive oral projects. In late June of 2015, he pulled four of my teeth (the most decrepit ones) for the sake of my overall health, and set me up with Dr. Noveck. “Between the two of them, they worked extensively to formulate a plan to alleviate the pain and discomfort I was suffering and to rebuild my mouth. They presented me with three plans for replacing my teeth that ranged from simple dentures to implants with removable prostheses and then, the most labor intensive plan, which was implants with permanently mounted prostheses and crowns for my remaining teeth. I decided to go with the latter of these plans. With Dr. Noveck, my periodontist and their respective staffs, I now had a dental team. “The plan was to do a series of extractions and implants in such a way that I would have temporary teeth throughout the process that was to take 18 months or more to complete. At the end of this time I would have crowns on my four remaining teeth, a total of eleven implants and four prosthetics attached to the implants. “Teeth came out, implants went in and temporaries were placed. Temporaries were replaced with permanent pieces, more teeth were pulled, more implants were placed, as well as temporaries, then temporaries were replaced with more temporaries. “As the plan was executed and work progressed, I got to know Dr. Noveck, his assistant Julie, and the office manager Debbie. I hadn’t even realized until then that having such intelligent, professional, caring and likable people on ‘my team’ was going have such a positive impact on my overall experience. I was actually enjoying the time I got to spend with them. What could have been a most horrific experience was turning into an enjoyable one. “From the moment I walked into the office I knew I would be taken care of by a group of professional, caring staff. Dr. Nosti examined my teeth, and I explained I was there for more advanced work. My regular dentist patched and glued all he could. I was ready to just pull all my teeth out; I was tired of breaking teeth. He took impressions and photographs and asked me to return to discuss what he found. He explained he was well-versed and lectured on bite, and showed me the computer program analysis. My bite was off, so the pressure was breaking my teeth. “In July of 2010 I felt a small ‘explosion’ in my right jaw. Little did I know this was the beginning of severe pain for almost two years. After being diagnosed, I began my long journey to set myself free of this pain. After eleven consultations and many different treatments, with no success, someone recommended Dr. Nosti. At first I was skeptical, but my pain kept driving me to try just one more professional. During Dr. Nosti’s evaluation he said he thought he could help me without braces or surgery. I began my treatment, and after a short time I finally was able to give up the pain killers and live normally. On my final visit I told Dr. Nosti how grateful I was for his care, and I truly am.” – G. H.